Year round availability and a range of accommodation to suit all budgets. Costs from £561 per person. 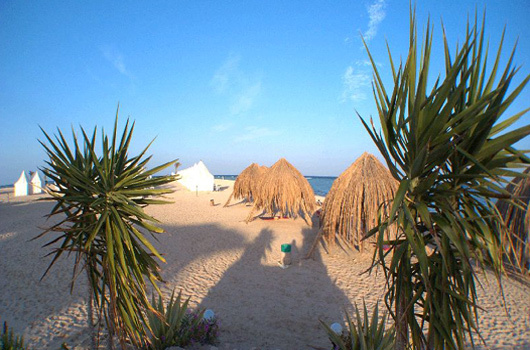 Located 3 hours south of Hurghada, near Marsa Alam, come and stay at the beautiful eco-village beachside resort from where you can take day trips out to a Marine Park Reserve. This offshore reef is situated one hour away from the Eco-Village Resort Holiday with day trips to swim with these wild dolphins and snorkel in the magnificent coral reefs where the boat moors up for the day. There are strict guidelines in place as this is a popular area for divers and snorkelers from the resorts along this bit of coastline. 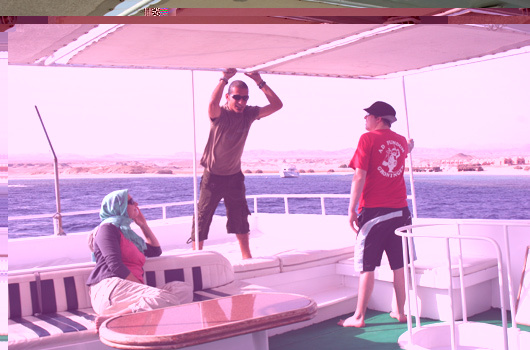 See the accommodation and pricing options and information on getting to Egypt. 7 nights accommodation, all meals served buffet style, excellent cuisine, free unlimited chilled mineral water, teas, coffee and soft drinks throughout the day and afternoon cake. Airport transfers and transfers to the Dolphin Swim boat. 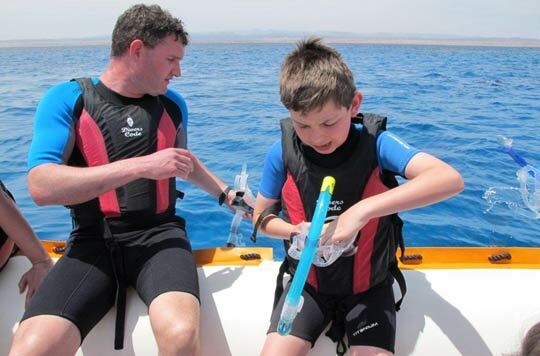 Services of dolphin swim guides and local hosts who will look after any logistics of the holiday, including a snorkelling briefing and safety talk. 3 day trips to swim with wild dolphins including lunch on board. Snorkelling excursion to see sea turtles (almost guaranteed as they live in the area) and dugongs (these are much more rare, you may be lucky!). On the other days you can choose to snorkel on the coral reefs from the beach of the eco-village. The zodiacs take you to other parts of the reef in the area from where you can snorkel back, or you can take extra trips to the dolphins, scuba dive or just relax and enjoy the peace of the desert and sea. Additional excursions include horse riding, camel treks, desert trips and city tours which can be pre-arranged or booked on arrival (subject to availability). Luxor is also possible to do as a day trip from the resort to see fine examples of ancient Egyptian cultural history. On the 3 Dolphin Swim day trips you will be transferred at 9.30am (40 min transfer) to the dive boat with other divers and snorkellers. Lunch on boat and return back about 4pm. After a 5 hour flight direct from the UK or main airports in Europe, we will meet your flight whatever time of day you arrive. 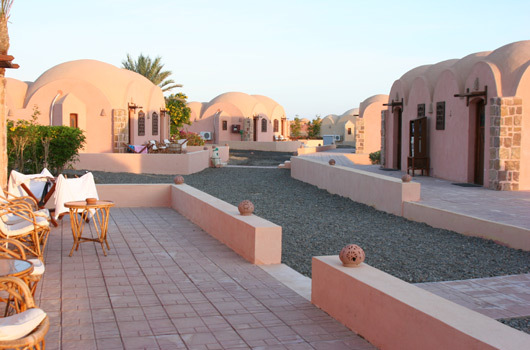 You will travel by air-conditioned car or mini bus to the Eco-Village near Marsa Alam where you will be greeted and shown to your accommodation. There will be a meal or a snack waiting for you in the restaurant, depending on the time of day. You will be given an orientation and a snorkelling practice on your first day to get comfortable with your mask and snorkel if you need to. There will be a safety talk and opportunity to snorkel in the bay close to the resort. Resort guides are available if you need them and various extra excursions can be pre booked or arranged when you are there. On 3 days each week we travel in well equipped dive-boats with upper and lower shaded decks, toilets, a salon and galley to the reef (in the Marine Park Reserve) and then swim with the dolphins in the sheltered bay. You need to be able to swim, but no diving experience is needed. You will be using a face mask, snorkel and fins. The Eco-Village Resort has a PADI-certified dive school, where it is possible to book introductory courses or for qualified divers you can dive at the many local world-class dive sites. Equipment may be hired on site. 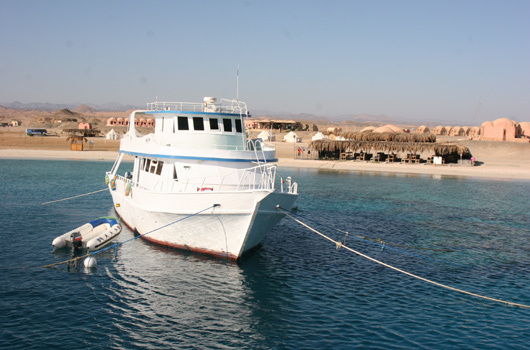 The U-shaped coral reef lies in calm turquoise waters off the Egyptian coast, one hour by boat. It has been designated a Marine Park Reserve so it is a protected area. A group of up to 200 Spinner Dolphins rest, play and raise their young away from the strong currents and dangers of the open sea. If the dolphins are outside the bay, our small (RIB) boat drivers will take you to them and drop you into the water beside them so you can watch them underwater and interact with them. This reef is a popular spot with divers so there is usually several other dive boats there and likely to be other swimmers in the areas where the dolphins play. The area is famous for the spectacularly beautiful coral reefs and very popular with scuba divers. You will also have plenty of opportunity to snorkel and be active in the water or take time relaxing on a sunbed on deck. While snorkelling you may see dolphins, turtles and rays or the very rare dugongs which live in the area. 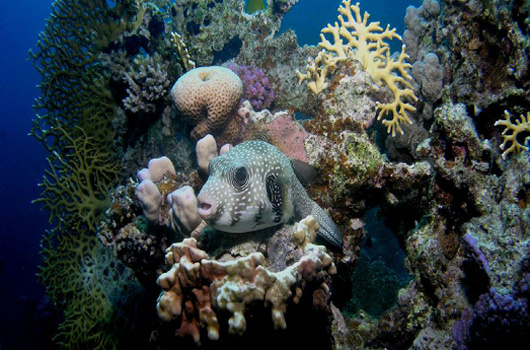 You can also enjoy the colourful coral and fish of the reef. Lunch is prepared on board in the galley. Ideal for families, small groups & individuals. We have a range of accommodation available from luxury air conditioned chalets to furnished tents to suit your budget, and further information on climate and what to bring is provided on the Fact Sheet. "Our holiday was SO WONDERFUL , is it possible to put into words how magical it all was! 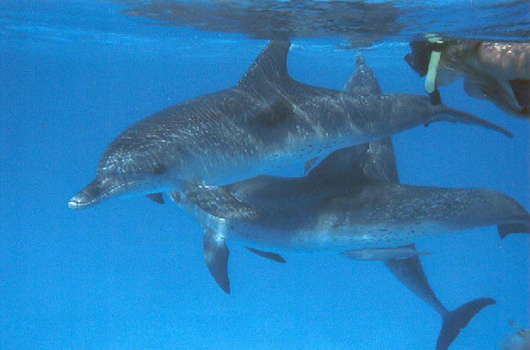 The holiday was an 18th Birthday gift to my daughter who had always wanted to swim with dolphins. I wanted an ethical company that was a fair price so it was an added bonus that the holiday was based in an environmentally-friendly, ecological centre and the dolphinswere wild and free."